On Valentine’s Day, cards created and given by a loved one can say much more than the words inside them. 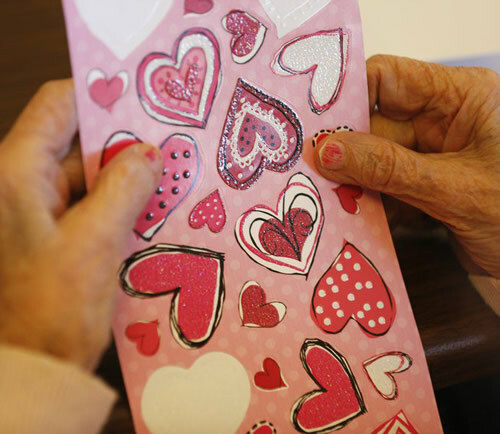 At Jill’s House Memory Care, a facility for individuals with memory problems such as Alzheimer’s disease and other types of dementia, residents were able to make Valentine’s Day cards for loved ones to say the words they may have trouble saying now. 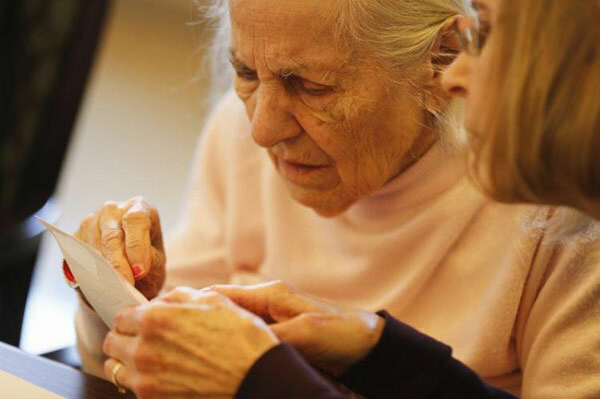 While the residents made cards, their caregivers — family members who give so much of their own time and energy — met in a support group and were able to talk openly about the challenges they face, with people who understand what they’re going through. The side-by-side support group/card-making event was the idea of Heather Kinderthain, Jill’s House community relations coordinator, and Leon Olenick, bereavement coordinator at SouthernCare Hospice. Olenick’s wife, Jackie, used her skills as an artist to help the residents create their cards. Events in which not only the resident, but also the caretaker are taken care of are crucially important, Leon Olenick said. Tuesday’s event was the first of a monthly series of side-by-side events that the Olenicks will lead. Every second Tuesday of the month at Jill’s House, free and open to the public, Jackie Olenick will help residents and members of the community who have memory-related illnesses to create an art project while Leon Olenick leads the support group. The Olenicks have created a few memories of their own over the years. After meeting Jackie when she was 12 years old, Leon, 14 at the time, was pretty sure he’d met the love of his life. When she turned 18, he married her. “There’s nothing else we’d rather be doing today,” Jackie Olenick added. While Tuesday’s event was the first of this kind, Kinderthain said Jill’s House has done similar events in the past, and they’re always beneficial to everyone involved, residents and caregivers alike. Jackie Olenick said making Valentine’s Day cards was the obvious choice for the project this time. Jan Bays, both a caregiver and director of program development and education at Jill’s House, said it was great that several caregivers joined their loved ones for lunch and conversation before breaking off into groups. This post originally appeared on Herald Times Online.